PT Jasa Raharja (Persero) - Jasa Raharja is a reputable state-owned social insurance company in Indonesia with core business competencies in accident insurance. PT Jasa Raharja (Persero) was formed in 1960 and is completely owned by the Government of Indonesia which represented by the Minister of State-Owned Enterprises (SOE). Based in Jakarta, Jasa Raharja has 29 branch offices, 62 representative offices, 63 service offices (KPJR) and 1,285 joint offices with SAMSAT spread across Indonesia (as of December 2016). Its head office is registered at Jl HR Rasuna Said Kav C-2, Kuningan Jakarta Selatan 12920. PT Jasa Raharja (Persero) also supported by 1 subsidiary company, namely PT Jasaraharja Putera which focus on general insurance and surety bond guarantee business. According to information found in PT Jasa Raharja (Persero) Annual Report 2016 as cited by JobsCDC.com, Jasa Raharja succeeded in posting excellent financial performance in 2016. Jasa Raharja booked total assets of Rp 13,122.70 billion in 2016 or growth by 12.49% from Rp 11,665.70 billion in 2015. Referring to its annual report, total underwriting income in 2016 amounted to Rp 4,503.24 bbillion. This reflected an 0.96% increase from Rp 4,460.24 billion in 2015. In year 2016, Jasa Raharja recorded a total consolidated net income of Rp 2,376.95 billion or growth by 2.34% from Rp 2,322.40 billion in 2015. Single/not married and Willing not to get married for 1 year since accepted as an employee. Maximum age of 27 years old (max 27th birthday on 4 August 2018). Minimum Bachelor Degree (S1) from a reputable university (PTN/PTS), preferably majoring in Finance, Accounting, Actuarial, Insurance, Law, Psychology, Risk Management, Information Technology, Economic Management, Mathematics / MIPA. Strong academic results with minimum GPA of 2.75 from PTN and 3.00 from PTS. Have a morale and able to work together in teams. Willing to be placed in all parts of Indonesia. Minimum Bachelor Degree (S1) from a reputable university (PTN/PTS), majoring in Computer Science / Information Systems / Information Technology or equivalent. Makassar: for Participants domiciled in Eastern Indonesia. Jakarta: for Participants domiciled throughout Indonesia. JobsCDC.com now available on android device. Download now on Google Play here. Please be aware of recruitment fraud. The entire stage of this selection process is free of charge. 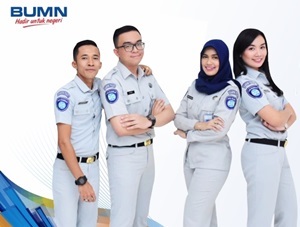 PT Jasa Raharja (Persero) - Operational and Administration, Information Technology Jasa Raharja August 2018 will never ask for fees or upfront payments for any purposes during the recruitment process such as transportation and accommodation.